Last week we set off on a little road trip to West Wales and a few days filled of free range fun at Bluestone, with the plan to have lots of quality family time without screens and focusing on the little things that are important to us like getting lots of fresh air, eating good food and being mindful of the present. The thing is when you are planning a simple and screen free getaway you need to be prepared and have a few things on hand so that boredom doesn't set in which it quickly can as the days come to an end and evening sets in. 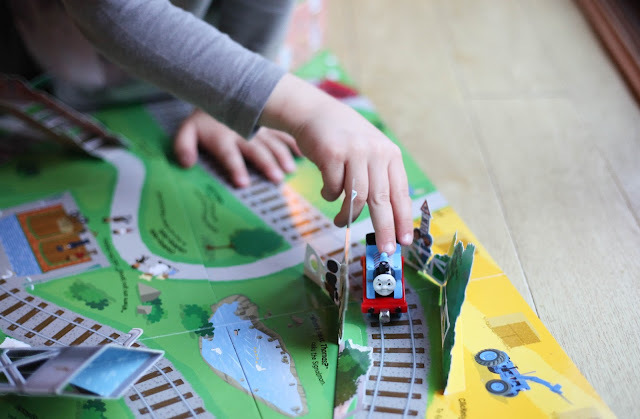 My eldest has always been fascinated with tractors and farm machines but Baby G who is now nearly 20mins is obsessed with trains and Thomas the tank which I find quite funny as we have always been a gender neutral household but they have both naturally geared towards these two things. 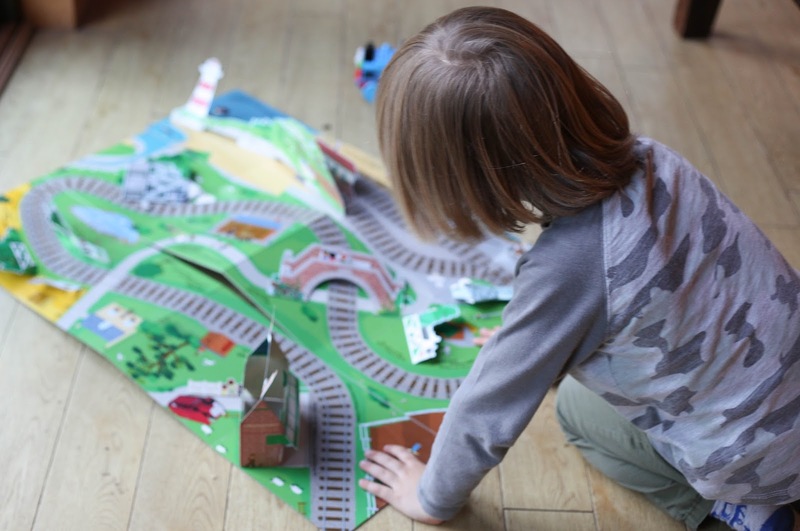 With Baby G being completely taken with trains is sparked something in my eldest as well who for the first time is also enjoy watching Thomas episodes as well as rediscovering the large train set we have. So we decided that taking the new Thomas Big Pop-up Journey with us on our family getaway would the perfect way to keep both boys happy in the evening while I made the food. 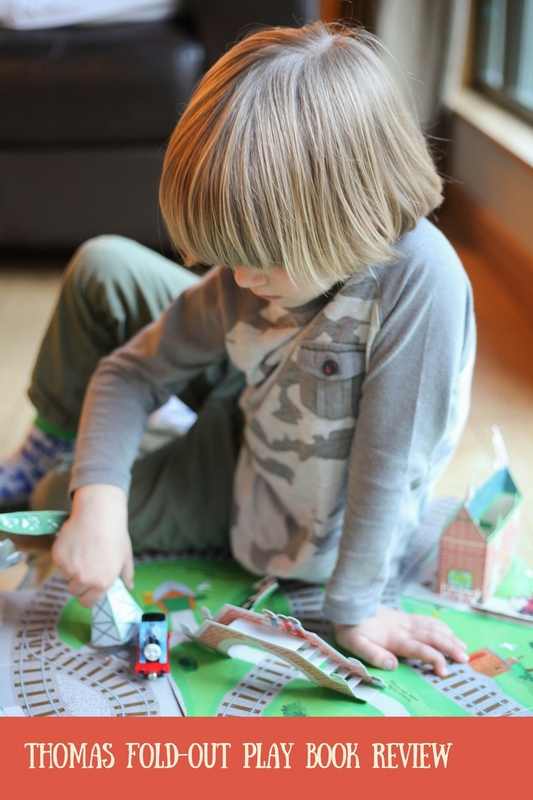 It's such a fun fold-out book which turns into a 3-D play mat and bringing the world of Thomas to life. The book also comes with loads of cardboard play pieces of all the favourite engines and Harold the helicopter and really does offer hours of fun and the chance for little ones to make up their own stories and bring the imagination into play, something which can be easily lost with phones and iPads offering up instant movies. It's really nice having something that engages young children but doesn't have any flashing lights or loud noises and gives them a chance to be in control of the story , which this book and play mat does. 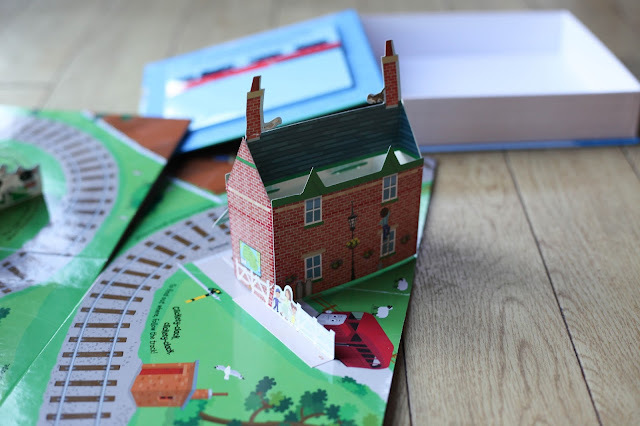 Best of all is I have a Thomas Big Pop-up Journey book to giveaway to one lucky reader. It's super easy to enter and closes on the 30th October 2016. Giveaway winner will be picked at random. My child's first favourite toy was a Lamaze knot that she could rattle. My son loved his giraffe toy! of all the expensive toys our little chap loves a 99p small rubber walrus! My daughter loves her Teddy Bear and my son's favourite first toy was his activity cube. My little man loved (and still does) a little rattle/plush toy crocodile, called chopodile. It came with a onsie, as a set when he was born and he's always loved it, since he could first hold anything other than my finger! A Teddy we won in a raffle. She has a little giraffe that she's taken everywhere for her whole life - it's starting to fall apart, but we can't find a replica! The chatterbox telephone she played with it all the while. A teddy that I had had since childhood. My eldest daughter still haves it today so it didn't get passed down any further even after having 2 more children since lol. My little man is still a bit too little just yet. But he has started to take some interest in his Sophie the giraffe. A cuddly musical zebra from jellycat. When he was only a few weeks old he would stare at it and bat at it with his fists. Thomas the Tank Engine toy train! A toy peekaboo (from Twirlywoos) - he takes it to bed every night! A teddy night dress case ! it got filled with cars, stickle bricks , wooden bricks and toast and marmite!! a homemade blanket with bits of ribbon and buttons attached! Gosh, I'm struggling to remember which one but I think it was a crocodile with a moveable head on a stick. She took it absolutely everywhere. It was an elephant cuddly toy. A lovely ELC caterpillar toy which I left on the bus and never found again! Cuddly Tigger but eldest used to take her first shoes to bed! 'Pink Ted' - the scruffiest, sun bleached, luminous pink and cheap Teddy Bear that my youngest daughter insisted went everywhere with her! An Oopsy Daisy soft toy.